Where the crack width is less than 10mm, the user can rout the crack to a depth of 10mm. But if the width is greater than 10mm, the user should set the router to 20mm. The operator can guide the router on the cracks and follow them backward. A key task after routing is to ensure that the area is clean of any debris as leaving any loose material or dust in place can result in a failure of the whole process. Using compressed air to blow out the debris is a useful technique, while a hot air lance (HAL) can also play a key role on sites where surface humidity levels are high. Any moisture left on the sides of the crack can result in early failures. The user has to select a rubberised hot applied sealant that best suits the materials and weather conditions. This sealant can then be gravity fed using cones into the crack area, a simple and easy method to carry out. Indirect heating of the sealant in a special kettle before the material is applied is important for the best rest results. Heating the sealant ensures that it bonds properly with the sides of the crack, providing a longer lasting repair. For the most efficient application, the kettle should be equipped with an oil jacketed tank and simultaneous agitation. Applying the sealant so that its top surface is around 2mm lower than the milled surface will minimise the need for raking with the new overlay. Once the sealant has been applied to the cracked areas, waiting for a week will then allow the material to settle properly. 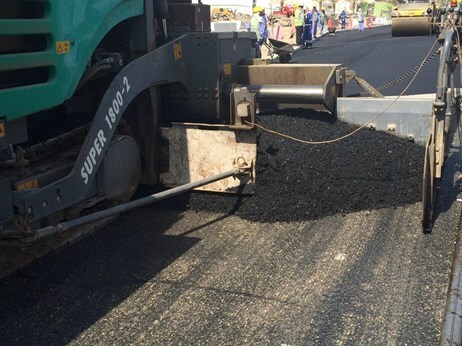 And before the new asphalt layer is laid, the milled surface should be cleaned effectively and also a suitable tack coat layer applied to ensure effective bonding.